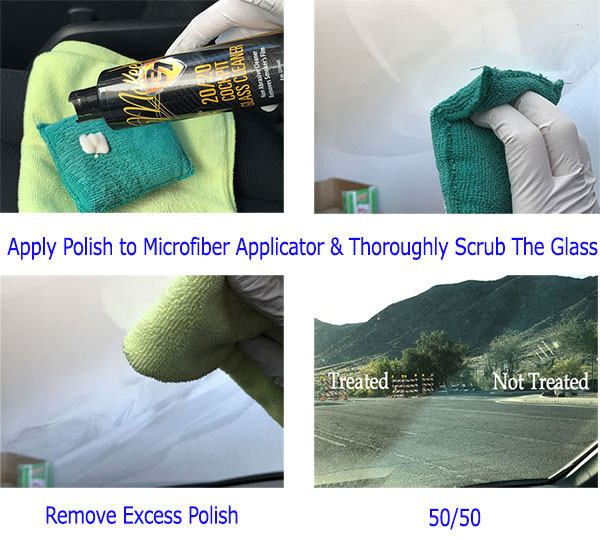 The secret to perfectly clear interior glass! If there is a single aspect of detailing that we all struggle with in one way or another, it's cleaning glass. Let's face it: you don't clean your glass as often as you should, especially the rear windshield and the small corner windows in the back of your sedan or SUV. When you attempt to clean it using a traditional spray on glass cleaner, what you end up with is less-than-stellar results. I'm happy to announce we have a solution! McKee's 37 2020 Cockpit Glass Cleaner is more than just a glass cleaner, it's a glass cleanser! Your windows have never been this clean -- I guarantee it! A traditional spray on glass cleaner works great if you clean your windows frequently, meaning once or twice a week. If you're anything like me, you clean the windshield often but you neglect to give the back windshield and side windows as much attention as you should. That's not a problem for McKee's 37 2020 Cockpit Glass Cleaner. This glass-cleaner-on-steroids is a lotion that dries to a haze, trapping smeary films so they can be wiped away with a soft microfiber towel. Smoker's film, vape film, and vinyl/plastic fogging is impossible to remove using a regular glass cleaner. McKee's 37 2020 Cockpit Glass Cleaner to the rescue! Apply using a soft microfiber sponge, allow the polish to dry to a haze, then buff it off. You will be amazed at how clean your glass will be. Nothing has ever worked better than McKee's 37 2020 Cockpit Glass Cleaner to remove stubborn film on interior glass. Something that finally got rid of the smudge 5 We bought a used Escape and the windshield had a film on it that would not come off. I tried my tint safe glass cleaner, regular windex, windex with vinegar, and rubbing alcohol. But it just came back. Jumped on some forums and came across this. Followed the instructions and wow, no more film. After telling the wife I had failed and she would have to live with it, now she was blinded by the sun coming through a krystal clear windshield. Man did this really work with just one application. Now all I have to do is clean it with the krystal glass cleaner and we're happy. Pros:Does what is suppose to do, remove nasty film from your windows. No more glare. Easily one of McKees best products 5 Ive used almost every McKees 37 product and this has to be one of their best. When you note how exceptional the entire lineup is, you know this product is top notch. It is a pleasure to use and makes window cleaning actually enjoyable. You cannot achieve clean glass like cockpit 20/20 provides any other way. Its like hand polishing the interior glass to perfection. Pair this with High Pwrfoemanxe Glass restore polish on the exterior glass, and you will have glass you literally cant see. Just so easy and simple. 5 This makes cleaning the inside of the windshield so easy. And in two simple steps. One, message into glass. Two, buff off with microfiber towel. Simple! Glass is clean. The easiest and quickest cleaning I have ever done on my windshield. 20/20 Cockpit 5 20/20 Cockpit is a pleasure to work with, It removes that stubborn haze/film that cant be removed with glass cleaner. It is really easy to apply. After it hazes up you buff it off to crystal clear glass. If you cant get your glass clean this will solve your problem.